It might not be possible for everyone to have it on local system. Here is the solution for this problem. You can install OpenStack and Murano on cloud. 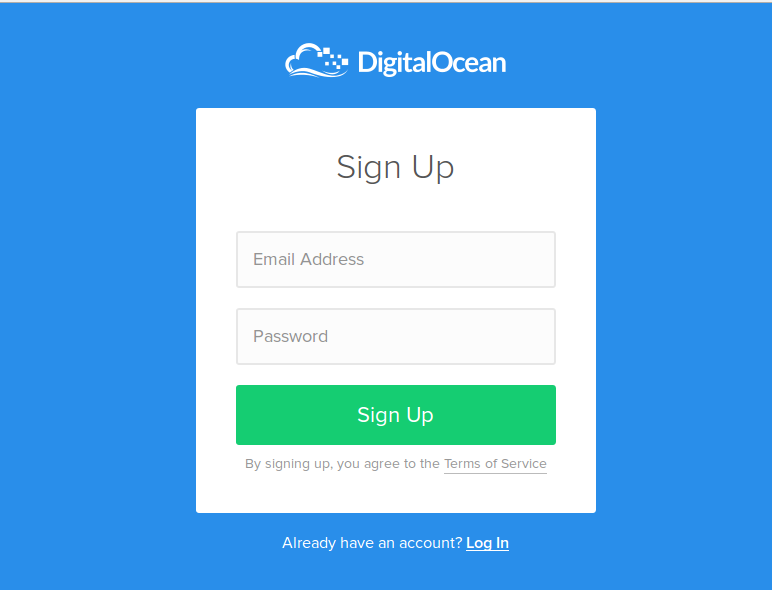 Here I am using Digital Ocean cloud service. Add required information and credit card and you are done with account setup formality. Step 2: Now create a Droplate (a virtual machine). 1. 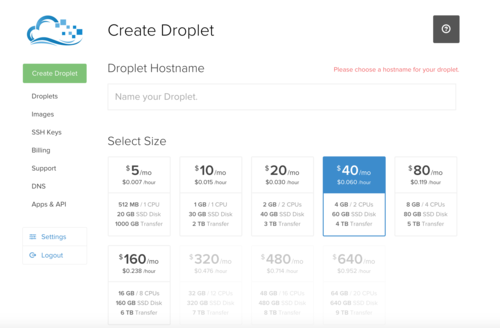 Provide a host name for your droplet. 3. Now select the region in which droplet will be hosted. 4. 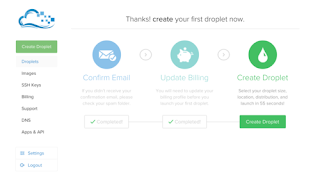 Select image to be installed on droplet. Here select Ubuntu 14.04 image. 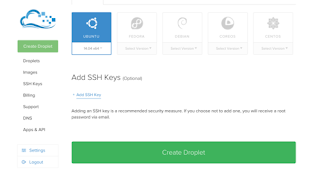 Copy ssh key from /home/demo/.ssh/id_rsa.pub file and enter it in the submission box. 6. Now hit "Create Drolet " button. Your Droplet is ready to use. After successful creation of droplet, you will get public IP address of your droplet which will be used for login into droplet. Now you are in virtual machine. Lets start installation of OpenStack. DevStack is a set of scripts and utilities to quickly deploy an OpenStack cloud. So lets start with devstack. a. Since you are using fresh new Ubuntu machine, first update and upgrade it. b. Install Git, since installation of devstack, will require cloning of repository. c. Clone Devstack repository that contains a script to install dev OpenStack. Clone it, where you want to reside your devstack. now move into devstack directory. d. Create stack user. Since you are logged in a system as root user, you need to create stack user to start installation. For it there is a script in devstack repo located in tools/create-stack-user.sh. It will create stack user. now provide ownership to the stack user. $ chown -R stack:stack . e. Now modify stackrc file to collect all the git repository via https protocol. For it open stackrc file and find GIT_BASE and alter it. 1. The contrib/devstack directory contains the files necessary to integrate Murano with Devstack. Copy this integration scripts at their respective places. a. First copy contrib/devstack/lib/murano file inside devstack/lib. b. Copy contrib/devstack/lib/murano-dashboard file inside devstack/lib. c. Copy contrib/devstack/extras.d/70-murano.sh file inside devstack/extras.d. 2. Now create a "localrc" file as input to devstack. This file contains all the necessary settings for murano. It starts Murano, Heat and Neutron services. 3. Change user from root to stack (newly created one). 4. Install devstack via running stack.sh script. 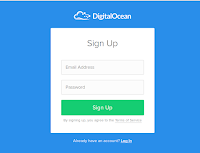 It will prompt you for passwords for various components of OpenStack. After successfully running script, it will provide end point for horizon service of OpenStack. Bu using this end point you can explore OpenStack services. Now you have successfully installed Openstack with murano. Enjoy developing with OpenStack and Murano! This post will lead you through successful installation of Django in Virtual Environment on Debian based system like Ubuntu. Here we will create virtual environment using most popular and recommended tool virtualenv and virtualwrapper. Virtual environment is a isolated Python environment that keeps python files in a isolation manner from system's python files and other virtual environment's python files. If you install any program using apt-get repository from virtual environment (created by virtualenv or virtualwrapper) then it will get install on whole system. To install python package only inside virtual environment, use pip or easy_install like python package managers. 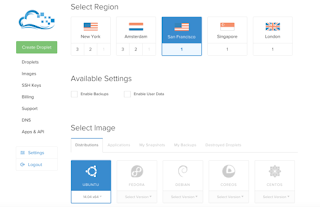 Why to install Django in virtual environment? After installing Django you will create several projects using it. It may happen that your two projects have same dependency but requires different version. And on a particular system, you can have only single version of any file. Now what?? Solution is Virtual Environment. Python virtual environment solves this problem easily because virtual environment keeps the dependencies required by different projects in separate places. It keeps your global site-packages directory clean and manageable. Virtualenv is a tool to cretae isolated Python environments. virtualenv creates a folder which contains all the executables you installed inside the virtual environment. virtualenvwrapper is just a wrapper utility around virtualenv that makes easy to deal with virtual environments. This post will cover working with virtualenv via virtualwrapper to provide ease. Good news for windows lover, virtualwrapper also has window version that is virtual-wrapper-win. Now you have installed virtualenv and virtualwrapper tool. Now you need to do some congifugration setting. Lets walk through that. The first line instructs virtualenvwrapper where to store the virtualenvs that will be created by you. Here we are storing it in a folder called .virtualenvs inside your home folder. The second line runs the shell script to set up the virtualenvwrapper commands. It should point to the location where virtualenvwrapper is installed. mkvirtualenv – It is used to create a new virtual environment. Created new environment automatically becomes the active environment. rmvirtualenv – It is used to remove an existing virtual environment. The environment must be deactivated (explained below) before it can be removed. workon – It is used to activate a virtual environment. Will also list all existing virtual environments if no argument is passed. deactivate - used to deactivate the currently active virtual environment. Note that workon will automatically deactivate the current environment before activating a new one. Now you have successfully installed Django in virtual environment. Thankyou for reading. This post is about mongoDB database, its installation process and its implementation through python. 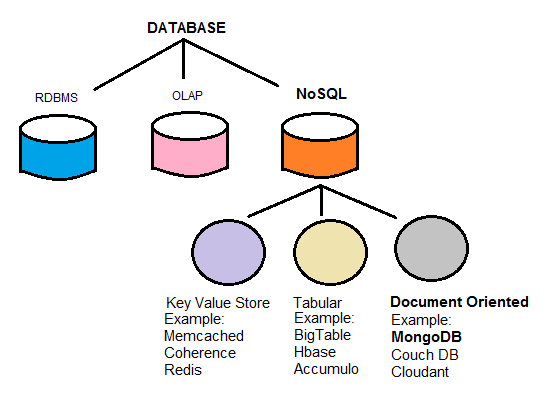 MongoDB is a scalable, open source, high performance, document oriented database. It is an open source product and developed and supported by a company called 10gen. MongoDB is available under general public license for free and commercial license from the manufacture. What is extra in NoSQL? 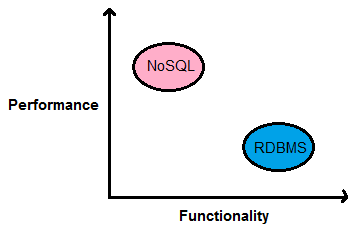 What is missing in NoSQL? 2. No complex transactions support. 2. Object and instance concept In RDBMS table is a object and each row is instance of that object. In MongoDB collection is a object and each document stored in collection is instance of that object. 4. Primary Key. It should be created by programmer explicitly. It is automatically generated if not mentioned by programmer and always denoted by key "_id". 5. Schema RDBMS is schema dependent. MongoDB is schema independent. 6. Horizontal scalability. Does not support. It supports. 7. Big data problem Does not capable to handle problem arise by data explosion. It is capable. 8. Information conversion Information is stored in form of relation hence when implemented with OOP languages data conversion is required. Information is stored in form of objects & its instances hence no conversion is required when implemented with OOP languages. This makes mongoDB faster. 1. It supports Ad hoc queries means it supports searches by field, range queries and regular expression searches. 2. Indexing is supported means any field in a document can be indexed. 3. Master-slave replication is supported. A master can perform read and write operation. A slave copies data from the master and can only be used for read or backup. 4. MongoDB can run over multiple servers and data is duplicated to give protection over hardware failure. 5. Automatic load balancing is built-in feature of mongoDB. 6. Horizontal scalability is most important feature of mongoDB. It means new systems can be added to existing database. Since performance is linearly proportional to no. of computers so it also increases performance. 7. Capped collection is supported means this type of collection maintains insertion order and, once the specified size is reached, behaves like a circular queue. 8. File storage system is supported by a special feature called GridFS. 9. Aggregation is supported through map reduce feature. 10. In query language java script function can be used which is a strongest feature. 11. It offers special support for locations since it understand longitude & latitude natively. Open the terminal (ctrl+Alt+t) and run the following commands (one by one). 1: Install pymongo library. Then import it through following code to connect to the mongoDB. 3: Now connect your database name and the collection name to mongoDB through above connection variable and store it in another variable for convenience. Here db variable is used. Students is the name of database and mva is the name of collection. 5: Delete the document through following code. It will delete the document where name is equal to ‘a’. (i) To view the single document from the collection use following instruction. It will print the first document from the collection. TO view the specific document condition can be provided I the round braces as in the remove instruction. (ii) To view all documents present in the collection use following instruction. This post is about the 32-bit and 64-bit computer system. 32 bit operating system operates/utilizes data in 32 bit pieces. It can address (point to or index to) 2^32 i.e. 4 Gigabytes of memory in one go. Ex. Windows 95, 98, XP(32 bit addition) are 32 bit operating system. 64 bit operating system utilizes data in 64 bit pieces. It can address or can point 2^64 i.e.16 Exabyte of memory in one go, which is equals to 17.2 BILLION Gigabytes. Ex. Windows 8, Windows 7, Windows Vista comes in 64 bit operating system. If there is more bit in operating system, it means that data can be processed in larger chunks. It also means that more accurately data can be processed. Second benefit is our system can point to or address a larger number of locations in memory. As the bit increases the more data can be processed at once, hence faster the system can operate. Since 32 bit operating system can point up to 232 memory addresses. It means memory size can be of 232 bytes i.e. It means 32 bit operating system is compatible up to 4 GB memory size. Similarly, 64 bit operating system can point up to 264 memory addresses. It means memory size can be of 264 bytes i.e. Hence, 64 bit operating system is compatible up to 16 EB memory size. But due to some licence issue it can compatible with less size of memory than 16 EB memory size. In this concept, the main issue is that computer works from hardware such as the processor, through the operating system, to the highest level which is application. So the computer hardware is designed first, the matching operating systems are developed and finally applications appears. Here the Backward Compatibility concept is applied. According to which back levels must be compatible with the higher levels. It means a 32 bit operating system will run on 32 bit or 64 bit processor without any problem. A 32 bit application will run on a 32 bit or 64 bit operating system without any problem. But a 64-bit application will only run on a 64-bit OS and a 64-bit OS will only run on a 64-bit processor. The main reason that 32-bit will always run on 64-bit is that the 64-bit components have been designed to work that way. So the newer 64-bit systems are backward-compatible with the 32-bit systems. One important point that it is not possible to install a 32-bit device driver on a 64-bit operating system. This is because device drivers run in parallel to the operating system. 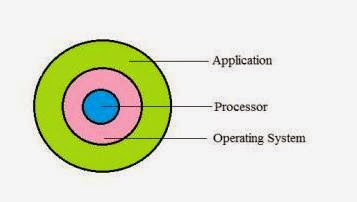 The emulation is done at the operating system level so it is available to the higher layer, the application, but it is not available to the device driver which runs on the same level.Hardware virtualization is the exception to the rule.